5% cash rebate at Sheng Siong. S$50 cash rebate cap per calendar month. 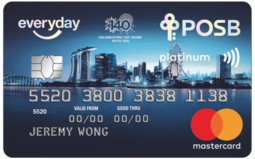 5% discount from any DBS/POSB Credit or Debit Card (except DBS Esso MasterCard) + 10% SPC&U Card discount + 6% POSB Everyday Card cash rebate after 5%+10% discount. 1% cashback on monthly bills from Best Electricity, Geneco, Ohm Energy, iSwitch, Tuas Power, and Union Power.